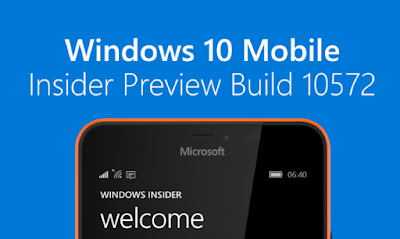 New build of Windows 10 Mobile in the Insider program. While testing program, they announced that the users enrolled in the ring fast Insider can now download and install the build number 10572 , which happens to compile 10549, which was just launched last week. This new build persists problems that prevents upgrading from previous builds of Windows 10 Mobile (thus forcing us to return to Windows Phone 8.1 to install it). In fact, that is why in Microsoft were not fully convinced throw it, but they were thinking of waiting until the build was ready in a few more days 10575 in which this problem is solved. But after doing a survey of Insiders , the voice of the people ended up saying something else, so it is to launch the build anyway. If you have a mobile phone with Windows 10, to install this new compilation must first return to Windows Phone 8.1 . This requires installing the tool Windows Device Recovery Tool on a PC, connect the phone to the computer, and follow the steps on the screen. Once we have returned to Windows Phone 8.1. it is necessary to log on with a Microsoft account registered in the Insider program , and then download the Windows Insider application from the store. Within it must accept receiving compilations Insider and then select the Fast Ring or snap ring. Finally, is just go to Settings> Phone update and download all updates that are available (you may have to restart the computer several times). Several of the new features in this build has already been leaked in recent days, but no less interesting. 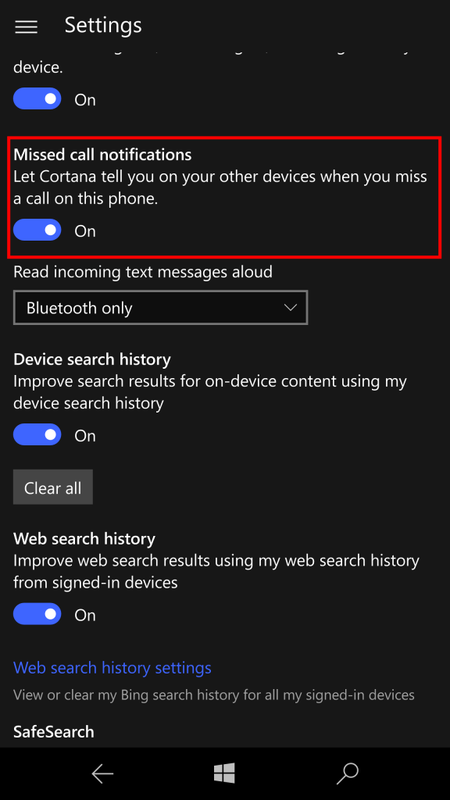 In particular, it draws attention to the integration with Cortana PC , which allows you to receive notifications of missed calls on the phone, and even send text messages from Windows 10 PC, exactly as it had detailed a couple of days ago. To send a text message from your PC you can use the same voice commands you would use on mobile. To use this feature must only make sure you are logged in with the same account in Microsoft Windows 10 to Windows 10 PC and Mobile, which call notifications appear on all devices connected to that account, and the support it is also activated to send SMS. However, if we have several PCs and do not want to see notifications of calls in all, we can easily disable them from the notebook Cortana . From this build it is now fully operational integration with Skype messaging applications, telephone and video calls. In addition, the messages application adds support for sending / receiving and animated GIFs to search for messages, and the phone application now allows you to search contacts directly from your call history. 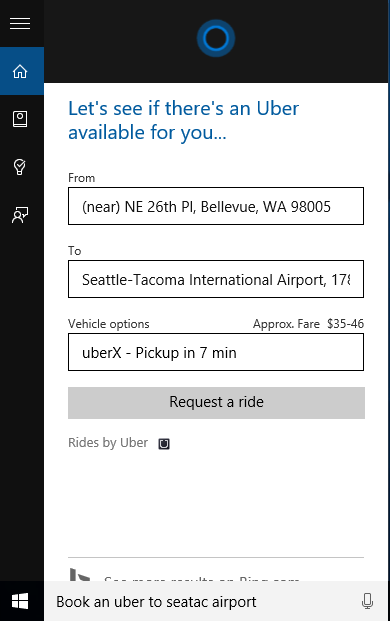 Mobile Cortana in Windows 10 now incorporates the same new features added to the latest build PC: Uber integration, and the ability to detect events that we attend (such as films and sports events) from your confirmation, and so deliver timely reminders 2 hours before they start. It is possible to receive notifications, such as text messages, without having to unlock the phone first. The background process Cortana is now more streamlined and no longer consumes as much battery. They resolve some of the problems that made the Home screen will not load properly, and performance improvements also apply to the operation of the Home screen. Performance enhancements to apply notification center. Now an alarm icon appears on the lock screen when the alarm is activated in the official application. Problems are solved with the proximity sensor that were observed in some equipment to make calls. Problems downloading apps in the store, which were blocked by a background process are resolved. The language on the keyboard is now ” less aggressive “. Now the phone is restarted immediately by pressing the “reset” button to apply an update. The visual voicemail does not work on some devices. In such cases we have to call directly to the mailbox to read our voice messages (for this we go to Phone> Settings> Change more options for Phone> Call voice mail . There are problems with the messages application on dual SIM phones. 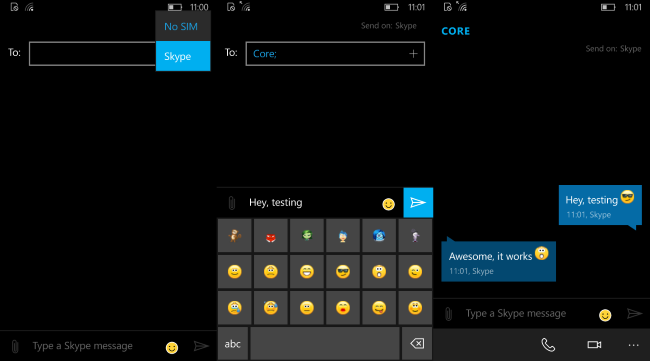 In particular, application errors will suffer if the tile of the second SIM messages is undocked from the Start. To solve this we must link the second SIM messages with the tile of the first SIM, which can be achieved by going to the messages of the first SIM> Settings> linking tiles. There is a similar problem with the phone lines dual SIM. To unpin the tile of the second telephone line, the line will also disappear from the list of all applications (ie, it is impossible to use it). To solve this we must restore your computer. The photo application does not allow sharing images via third-party apps like Instagram, WhatsApp, Facebook or Messenger. On some computers it is possible that the Photos application crash every time we tried to open it. This can be fixed by restoring the computer. Computers that have been upgraded from Windows Phone 8 to Windows Phone 8.1 and then to Windows 10 Mobile can lose the ability to connect to WiFi networks, or may even be unable to install builds Insider. To solve this you have to install Windows Phone 8.1 using Windows Device Recovery Tool . If you have any more problems with this build and want to get help with windows 10 then kindly contact us or comment below.